All magnifications refer to a 13 inch (32 cm) wide screen set to 800 x 600 pixels. 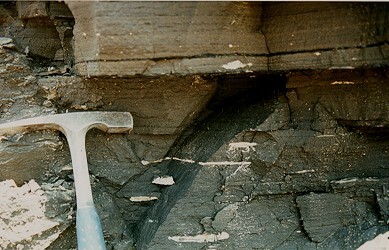 Laminated silt, weakly iron stained, approximately natural size. 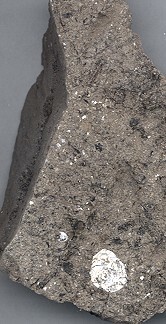 Freshly exposed material is brownish gray, of low chroma. Closeup, times four. Graded bedding, and a minor disconformity become conspicuous. The small offset visible on left is real, and about an inch long. Such features are quite abundant. A few of the beds are cemented, remaining intact and brittle when wet. This fine grained sandstone grades in color from 10 YR 5/2 on the upper surface to 10 R 4/2 in the center. 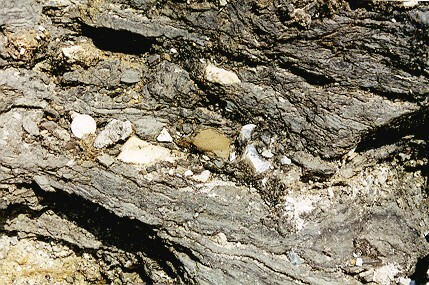 Cementing materials not yet determined, probably siderite (see Thin Sections). Four times magnification. damp, immediately after being broken. 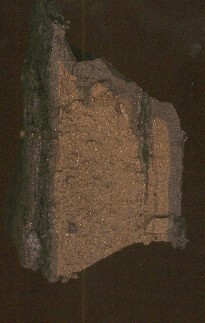 Exposure of dark laminated clay with in situ gravel. White circle on left is 5 cent nickel. 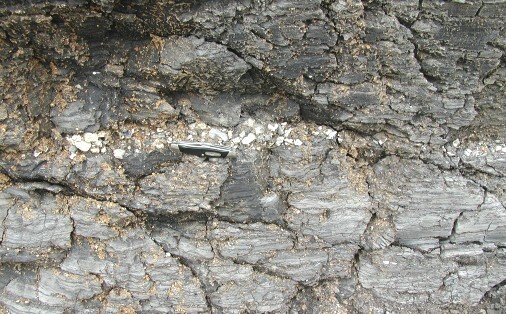 Another of the many chert gravel layers, pocket knife for scale. Photo Dr. Robert Hatcher. Exposure of weakly layered angular chert gravel, dipping beds, in north corner of the excavation. Most of this material is now destroyed. Photo Dr. Robert Hatcher. 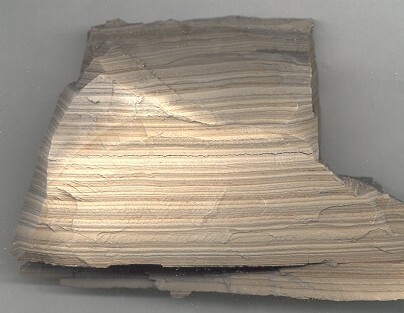 Exposure of dark clay with streaks of sandy-textured partially decomposed dolomite. 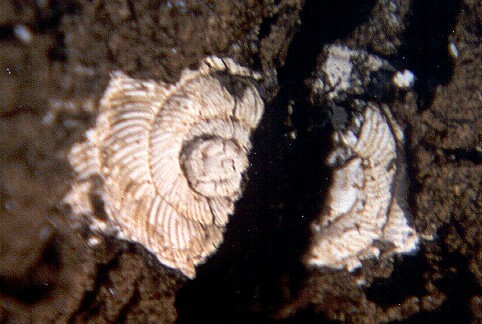 Ostracod-bearing bedding surface in black layered clay, about 3/4 times natural size. Eight-times magnification of poorly-preserved ostracods.